It is no secret that houseplants can beautify your home and office as well as freshen the air, promote relaxation and improve concentration. But if you’re tired of plain foliage and miss the colorful bursts of your annual and perennial flowerbeds, why not opt for flowering plants indoors as well? There are many beautiful bloomers that can brighten up your home and office throughout the year. Paphiopedilum (Lady Slipper Orchid) – Blooms once per year with blooms lasting 6-8 weeks, very exotic. This popular plant produces a profusion of colorful flowers that bloom for a long time, ideal for adding reliable color and life indoors. 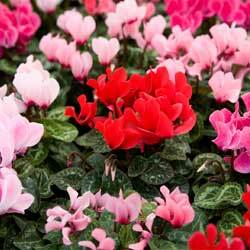 Keep cyclamen evenly moist from September through May. Let them dry from June to August, so the tuber can rest and recover from the intense effort of the prolonged bloom cycle. Ideal light is a sunny east or west window. Cyclamen prefer a cool room (60-70 degrees). Feed them from September to May, then stop for the summer months. These small, robust plants are by far the most popular houseplant and among the easiest flowering houseplant that blooms all year long. Choose from a wide selection of pink, purple, magenta, white and blue options in both double and single blooms. 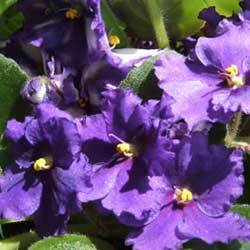 African violets prefer bright, diffused or artificial light. Feed regularly and water from the bottom so as not to get water on the leaves, which could promote diseases and fungus. Be sure to empty any excess water so the roots do not rot. These blooming plants’ flowers last for many weeks. Kalanchoes grow 8-12 inches tall with masses of small four-petaled leaves that are red, orange, coral, gold, yellow and purple. They have thick, waxy leaves with a succulent appearance and can withstand periods of dry soil, making them a good option for beginners or in offices that may be closed for holidays or other periods when the plants may be somewhat neglected. Water when soil feels dry to the touch and drain excess water from tray. 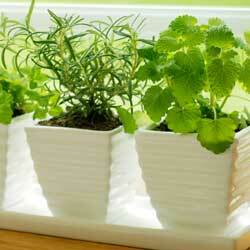 Maintain flower color with bright, indirect sunlight daily for at least four hours. If you haven’t tried it, the art of training a dwarf potted tree is a fascinating hobby. Because the soil around the bonsai plant is limited, these plants need watering almost every day, and sometimes twice a day during the hot summer. We carry a wide selection of starter plants and mature specimens from evergreen selections to tropical varieties. Some will bloom with true flowers, while others – though they don’t produce flowers – have such delicate and pleasing structures that their appearance is every bit as lovely as the most gorgeous bloom. Not sure which blooming plant will be best for your home or office? Stop in and we’ll be happy to help you choose just the right plant to brighten your space!